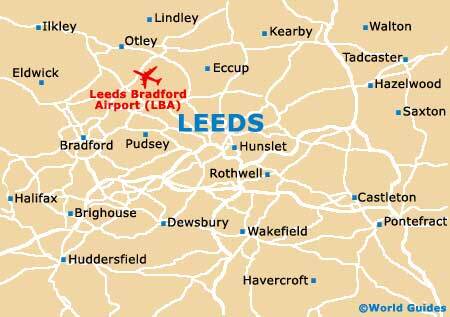 Located in the north of England, Leeds is considered to be the UK's favourite city. Leeds is full of exciting places to visit, innumerable Victorian buildings and arcades, shopping centres and canalside walks. Formerly a city associated with the manufacturing of textiles, Leeds is now an important financial centre, second only to London, and is equally proud of its vibrant nightlife, ever-increasing tourism scene and extensive selection of prized restaurants. 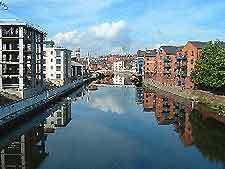 The city is divided by both the River Aire and also the lengthy Leeds to Liverpool Canal. Both the bus and railway stations are to be found within the city centre itself, although the best value hotels tend to be a short bus journey away. Tourist information in Leeds is available at VisitLeeds and Art Gallery Shop on Headrow, close to Leeds Central Library and the Tiled Hall. When it comes to hotels, if you arrive in the city without first booking accommodation, then the official Tourist Information Centre (TIC) really is the best place to come, since they can check availability, make bookings on your behalf and offer various special offers. 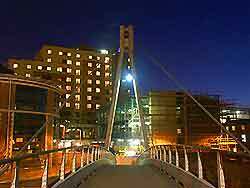 B&Bs in the city are generally on the basic side, with the most well-placed being situated just behind the campus of the University of Leeds. On the north-westerly outskirts of the city, in the nearby suburb of Roundhay, the Roundhay Park Caravanning and Camping Site is a good alternative for holiday makers trying to stick to a tight budget. Leeds is home to numerous sights to see, such as the City Square - a large, public square which is well pedestrianised and surrounded by a mixture of historic and modern buildings; the Waterfront - transformed into a trendy place to shop and eat after an innovative redevelopment scheme; the Millennium Square - in the heart of Leeds city centre, capable of accommodating more than 20,000 people and including the famous Nelson Mandela Gardens' the Victoria Quarter - home to an enormous array of shops, fashion outlets and highly regarded restaurants; and the Embsay and Bolton Abbey Steam Railway - on the outskirts, providing scenic journeys into the Yorkshire Dales. Other popular tourist attractions include the Leeds Tropical World - featuring one of the largest collections of tropical and exotic plants in the United Kingdom; the Lightwater Valley Country Theme Park - close to Leeds, with an exciting roller coaster and numerous fast, thrilling rides; Harewood House - a grand, 18th-century manor house, with spectacular gardens and many seasonal events; the Royal Armouries - one of the most eye-catching, modern landmarks in the city, with large collections of military artefacts; Temple Newsam - a historic mansion house, with a large collection of spectacular paintings, landscaped gardens and parkland and summer concerts; and Sunday Funday - a popular event for children in the city centre, with entertainers, puppet shows, face painting, music and theatrical performances. 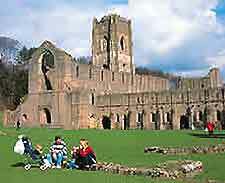 More information about Leeds Tourist Attractions and Leeds Landmarks. Leeds also has a number of excellent museums, providing interesting information and heritage exhibitions. Some of the most visited include the Thackray Medical Museum - celebrating the wonders of surgery through the ages, and recently awarded a Gold Award for Small Visitor Attraction of the Year; the 18th-century Bronte Parsonage Museum - once home to the famous Bronte sisters; the National Museum of Photography, Film and Television - full of vast collections of memorabilia from television programmes and films; the Ilkley Manor House and Museum - a grand, Elizabethan manor house with ruined remains of an important Roman fortress and collections of Roman artefacts; and the impressive Eureka Museum for Children - with an enormous number of themed-interactive exhibits. There are also many interesting and charming towns, cities and enticing tourist destinations nearby worth visiting during your stay in Leeds, such as York, Clapham, Grassington, Harrogate, Haworth, Holmfirth, Ilkley, Masham, Ripon, Skipton, Wetherby and Whitby. Many of these towns hold regular markets, with York being known for its magnificent Minster Cathedral, and Whitby for its sandy beaches and enticing coastline. With spreading parks and landscaped gardens, in and around Leeds city centre, a helpful tourist information office, an efficient public transport system and a large airport close to the city, in nearby Yeadon, wherever you venture in Leeds, you will always be sure of a warm and friendly Yorkshire welcome.